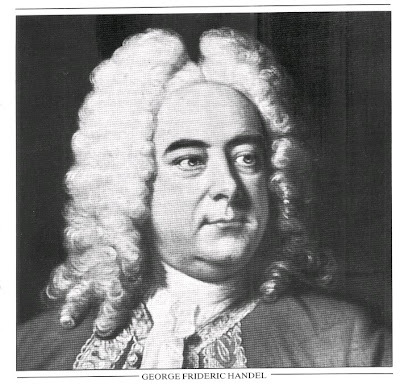 To celebrate the victory won by the combined Austrian and British armies over the French at Dettingen in Lower Franconia on 27 June 1743, George Friedrich Händel - who had been court composer in London since 1723 - composed a festive Te Deum and the Anthem The King shall rejoice. These works were completed during July/August, and on 27 November, after at least three public rehearsals, they were performed at St. James's Palace in the presence of King George II. 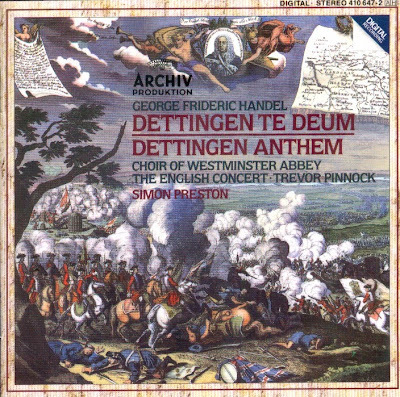 An official victory celebration which may originally have been planned for St. Paul's Cathedral did not take place; nevertheless during later years the Dettingen Te Deum received many large-scale performances. The Hymn "Te Deum Laudamus" has its appointed place in the daily office of Matins in the Roman Catholic Church, and - To English words - in the Morning Service of the Anglican Church. SInce the century the Te Deum has also often figured in state services of celebration and thanksgiving. For such an occasion, St. Cecilia's Day in 1694, Henry Prucell wrote a festive Te Deum and Jubilate, and these settings were widely used until 1713, when they were partially supplanted by Händel's Te Deum and Jubilate written to celebrate the Peace of Utrecht. This Utrecht Te Deum was, in turn, superseded in 1743 by Händel's Dettingen Te Deum. All three settings have, however, continued to be used on St. Cecilia's Day and on other occasions such as the Festival Service of the Songs of the Clergy. The text of the anthem The King shall rejoice was chosen from verses of Psalms 20 and 21, its first section corresponding to the first coronation anthem which Händel had composed in 1727. The psalmist's words are followed by an Alleluia. The second section, His honour is great, shows in such features as its prelude in the trio sonata style and bravura violin figuration the extent to which the 18th-century anthem had absorbed concertante elements from the Baroque cantata. The works concludes with a choral fugue. The lively principal subject is joined at the words Alleluia by a second subject, with a prominent downward leap of a seventh, of a kind vera often to be met with in Baroque music. Sufficient to mention here the chorus And with his stripes in Messiah. Händel used this entire number, with the same words, as the concluding chorus of his oratorio Joseph and his Brethren (1744). The CD was released by Archiv Produktion, 1984, (DDD). 410647-2.